From this page you can browse some of the different gaskets that we manufacture, by type and application: from standard pipe gaskets, to manway gaskets, to parts for classic cars (watch a video of some of the different parts that we manufacture here). We supply parts such as these to a range of industries: such as electrical, pharmaceutical, and automotive. We can also manufacture bespoke parts from technical drawing, sample, or sketch. Specifications & Traceability: Specifications can be downloaded fromindividual pages of the website, or from the specification section. If you cannot find information about a certain property of a material, or its suitability for a particular application, then please contact us for help and advice. If you, or your customer, require traceable certification then please tell us before you order your material, and this can be supplied upon request. Minimum Order Quantity: We have no minimum order quantity. 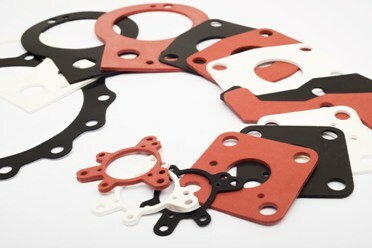 We are as happy to supply a single sheet of gasket material, and we are several roles. Quality: We are ISO 9001 and ISO 14001 quality approved.